In the five years that I’ve been writing this column, no piece has been more controversial (to put it mildly) than my argument against one of Alfonso Cuarón’s complicated single-take shots in Children Of Men. Pretty much nobody agrees with me on that particular subject, and that’s fine—I made the best case I could that Cuarón’s “impossible” camera movements are the director distractingly showing off, in a way that I still believe undermines the very tension they’re meant to sustain. But I can’t argue with the overwhelming majority of folks who insist that they aren’t distracted in the least. (For the record, I love the lengthy opening shot of Gravity, in which the weightlessness of space completely justifies Cuarón’s floating camera.) The primary rebuttal in the comments was that conventional editing would have dissipated the sense of helplessness that overwhelms the scene—that a cut, in essence, lets the viewer off the hook to some degree. My response was that continuity editing, done skillfully, is practically invisible, and that—for me, at least—not cutting actually calls more attention to the filmmaking process than cutting would. We can agree to disagree about this. However, I’d like to take another stab at a defense of montage, which I’m not using in the Team America sense (“In anything, if you want to go / From just a beginner to a pro / You need a montage / Even Rocky had a montage”), but in opposition to that oft-confusing French term mise-en-scène. To overly simplify, mise-en-scène refers to the composition of an individual shot, while montage refers to how contiguous shots relate to one another. Both are important, but the latter has been getting an increasingly bad rap for decades now, starting with the advent of music videos and continuing through the ascendancy of Michael Bay. Cutting is frequently perceived as lazy at best, crass and obnoxious at worst—and it can be, just as any other technique can be when poorly applied. It can also achieve almost subliminal effects that an extended single take can’t. John Travolta’s celebrated solo dance routine in Saturday Night Fever is a perfect example. Before I get to the technical stuff, let me say a word in praise of how this scene is constructed dramatically, which applies equally well to the film as a whole. 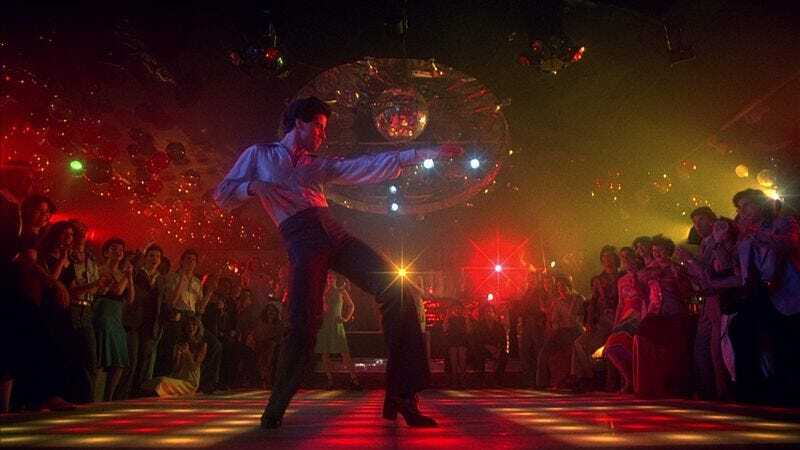 Everybody who’s ever seen Saturday Night Fever (along with most people who haven’t) remembers Travolta’s Tony Manero strutting his stuff here—it’s the most iconic moment in the movie, with Tony literally strutting to “Stayin’ Alive” in the opening credits taking a very distant second. Until I revisited it just now, however, I’d forgotten that the early dance routine is bracketed by Bobby C. (Barry Miller) pestering Tony’s older brother, Frank (Martin Shakar), who’s a priest, about getting a papal dispensation for his girlfriend’s abortion. It’s a potent reminder—just one of many—that these characters use the disco as a means of escaping their otherwise frustrating existence, and the fact that “You Should Be Dancing” can still be clearly heard in the background, as Frank tells Bobby that the Pope isn’t going to rescue him from his problem, is no mere happenstance. Even at the height of Fever’s euphoria, grim reality keeps intruding, which is the film’s plan of attack in a nutshell. Actually, the reality on the dance floor is pretty grim, too. Tony is remarkably cruel to Connie (played by the young Fran Drescher, with comparatively mild accent and nasal delivery), who comes on way too strong but doesn’t necessarily deserve to be openly insulted. She takes it in stride, though, and quickly disappears when Tony decides he’s had enough tedium and proceeds to put on a show. I’m just a little too young to know whether people at discos would actually step aside and watch the best dancers do their thing (that seems implausibly cordial), but it makes for a show-stopping sequence—especially after all those bodies get out of the way of the multi-colored dance floor, which has its own signature moves via lighting. Travolta was known primarily for his role on Welcome Back, Kotter at the time, and was by no means a professional dancer, but you wouldn’t guess that from watching him here. It’s a testament to how beautifully he moves that he pulls off even the most laughably dated, endlessly parodied disco poses, making them look cool rather than stupid. Well, except maybe for that index-fingers-tour-my-crotch bit. Here’s the thing, though. Travolta is really dancing, and director John Badham’s staging of the sequence reflects that—Travolta’s not being hidden by a flurry of quick cuts, as today’s stars tend to be when they attempt something like this. (See: Chicago.) At the same time, though, the dance is not a single unbroken take, though it plays like one. It’s made up of 14 separate shots. Three are cutaways to Tony’s audience enjoying his display, and I think those are a big mistake (especially the final, embarrassing one of the woman sitting on the floor, who says two words that sound like a weird combination of “Oh yeah!” and “All right!”). In every other instance, however, the cut is seamless, occurring in the middle of a particular move that’s still in progress when the angle changes. Badham clearly shot multiple takes, but he, along with editor David Rawlins, successfully creates the illusion of a continuous performance by consistently cutting on action. Unless you’re looking for the edits (as you likely were just watching that clip, because I’d raised the subject), most of them likely escape conscious notice. They’re all very fluid. Could this sequence have been captured in a single three-minute take? Sure. Would it have been effective that way? Perhaps. Most of the Fred Astaire and Ginger Rogers routines were shot from a fixed distance, without cuts, and they’re all glorious. But they’d be equally glorious onstage. What cinema can do that theater can’t is juxtapose two images in a way that creates a feeling neither image alone could inspire. The most electrifying moment in Travolta’s dance, to my mind, occurs on the cut from shot seven to shot eight. Shot seven pulls Tony the length of the dance floor, watches him do his little box shuffle (the same steps performed in the four compass directions), then shifts to the classic hip-and-point move that defines disco dancing more than any other. Badham then cuts, right in the middle of an established right-left-right pointing bit (it goes R-L-R, R-L-R, R-cut-L-R), to a low-angle, dead-center shot of the dance floor. Tony is at the center of the frame in both shots, but this sudden shift in angle has a galvanizing effect that moving the camera in real time from the first position to the second couldn’t possibly achieve. It’s a medium-defining moment—if I were trying to demonstrate what cinema is to someone with no knowledge of it whatsoever, that cut is one of the examples I’d use. Unlike, say, the bone-to-spaceship cut in 2001: A Space Odyssey (which I’d also use), it’s not creating an idea by juxtaposing two different things. Rather, it’s creating an emotion by juxtaposing two different angles of the same thing. Quite how that works remains a mystery to me, but I maintain that it’s at the heart of how movies work, much more than are complexly choreographed camera movements (satisfying though those, too, can sometimes be—I’ve also written glowingly in this column about the opening of Orson Welles’ Touch Of Evil). Editing is not something to be avoided whenever humanly possible. It’s a tool. Arguably, it’s the most important tool of all.